“Must” is a pushy word. It is a word of insistence. It can imply stubbornness, or worse yet, arrogance. Its over-use can be counter-productive, and its suggestion of adamancy makes it vulnerable to visceral says-who responses. However, even though the “must” word should be used with caution and restraint, there are times when it is the correct word; the appropriate word. There are times when the first steps in resolving a problem are clear. There are times when those first steps are based in objective logic and supported by broad consensus. This article will suggest that in context of USA oil spills and pipeline leaks some of the problems are obvious; some of the solutions are clear, and some things must be done. Now. In the admitting spirit of disclosure, this article is written in response to two of the more recent spillages – both close to my homes. The first “with corporate deep regrets” spillage occurred six months ago in my home state of Montana. In January, 2015 a pipeline leak released 50,000 gallons of oil underneath the frozen Yellowstone River. This spill occurred a mere four years after an earlier 2011 spill when another 63,000 gallons of oil leaked from an Exxon Mobil pipeline along an 85-mile stretch of the same scenic river. In an event of calendar curiosity, this year’s 2015 Yellowstone River spill occurred on almost exactly the same day that Exxon Mobil finally agreed to pay a paltry $1.0MM fine and to settle with the impacted Montana residents for $2.0MM resulting from the earlier 2011 leak. The second “with corporate deep regrets” spillage which triggered this article occurred in May, 2015. In this instance, more than 105,000 gallons of crude oil flowed from a rotted-out Plains All-American Pipeline onto the shorelines and coastal waters near Refugio State Beach in Santa Barbara County, California. This spill occurred almost exactly on the 45th anniversary of the 1969 Santa Barbara oil spill which, in turn, led to the first ever 1970 Earth Day. 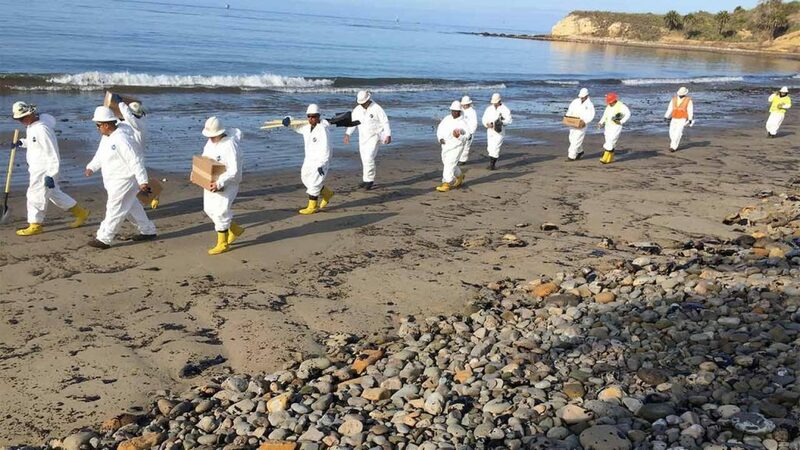 The corporate drill and the initial results at the Refugio State Beach spill have been pretty much the same as with all shoreline spills – immediate response teams, regulatory reporting, impact assessment and clean-up crews, corporate damage control, dead birds and animals, campground and beach closures, shut-down of commercial and recreational fishing, and years of oil-covered waters and oil-tar beaches. The subtle significance of these Yellowstone River and Santa Barbara spills is that they are not unique. In fact, they are common. It was noted more than a decade ago that oil spillage “has increased dramatically,” and that there are “more spills occurring more frequently in more places with more damage.” Etkin, D., “Environmental Research Consulting, US EPA Archive Document prepared by Environmental Research Consulting (2004). There are about 14,000 reported spills a year – or about 38 a day for those who like tighter math. Most of them are small and contained. But some of them are not. Some of them have been catastrophic in size, impact, legacy, and even loss of life. Some break through to the national news such as the 1989 Exxon Valdez spill when 10.9MM gallons of oil were spilled into Prince William Sound in Alaska or the more recent and more devastating 2010 Deepwater Horizon disaster in which 11 people were killed and over 200.0MM gallons of oil spilled into the Gulf of Mexico. It is interesting, if not pathetic, to note that the Exxon Valdez spill — though a vivid part of this nation’s recent history — is no longer even in the top 50 oil spills worldwide. But whether they make the national news or otherwise, spills occur on a regular basis. They are not isolated incidents. They are not mere industry concerns. They are not containable as an oil patch problem. To the contrary, spills routinely occur in nearly every region of the country – for example, Rhode Island (Moonstone Beach, 1996 – 840,000 gallons); Texas (Galveston, 1990 – 5.1MM gallons); Massachusetts (Buzzards Bay, 1976 – 7.7MM gallons); California (Santa Barbara – 1969 – 3.4MM gallons and 2015 – 105,000 gallons and Bolsa Chica State Beach – 1990 – 300,000 gallons), North Dakota (Fargo – 2013 – 896,000 gallons); and Maryland (Aquasco/Patuxent River – 2000 – 945,000 gallons). The stubborn reality is that oil spills remain both commonplace devastating. Despite calls for liability, fines, and lawsuits; for automatic shutoff valves and dual-hulled ships; for better inspections and faster responses, little has changed. And thus, the other stubborn reality is that more meaningful courses of action are necessary. This article proposes four steps which must be done in order to achieve three, inter-related goals: (1) To lessen the number and impact of oil spills; (2) To assure that the public becomes better informed, and (3) To assure that a higher and more impactful level of accountability is imposed upon oil, pipeline, and shipping companies. Collectively, it is hoped that these four steps will lead to a far more protected environment, a far more meaningful assignment of liability, and a far more diligent and responsive pattern of corporate activity. First, to the extent not already in place due to jurisdictional differences, corporations responsible for oil spills must be held to the standard of strict liability. Very generally, strict liability is a standard of liability whereby a person or corporation can be found legally responsible without any showing of intent, fault, negligence or intent. This is not a unique concept in the law. Strict liability is imposed in many criminal and civil contexts. It is used to impute liability in those situations which have been determined as a matter of law to be inherently egregious or dangerous. As a matter of policy and statute, society has determined, for example, that analogous strict liability should apply in a wide array of contexts — from negligent homicide to vehicular traffic accidents, from child endangerment to the ownership of unsafe housing, from various zero tolerance policies to a multitude of product liability cases. For very similar reasons, the strict liability standard should be made to apply to all oil spills. The parallel reasoning is because oil spills cause material, long-lasting, and oftentimes non-curative impacts upon families, businesses, communities, and the environment and because it is within the powers of corporate management – albeit costly — to establish the policies and, as applicable, to implement the design, inspection, and maintenance procedures to eliminate them. As we have seen from the 2010 Deepwater Horizon tragedy, they can also cause loss of life. It is anticipated that there will be a deluge of slippery-slope arguments, but they should be rejected because except in certain instances (e.g. acts of war, sabotage, or extreme natural disasters), oil spills are definable, foreseeable, and avoidable. Furthermore, oil, pipeline and shipping companies have had their chance to take all preventative actions. Instead, spills still occur. Instead, claims are denied or postponed by litigation. Instead, the ultimate consequences are minimized or monetized by the talents of well-paid lobbyists or lawyers or both. I have a close friend, a good man, who made a career out of the thousands of barrels of litigation flowing in the aftermath of the Exxon Valdez spill. We all know the drill, and while there must be a procedure for the rejection of baseless and fraudulent claims, we also know that litigation is routinely used as a tool. The time- and cost-drag of litigation is used to wear down plaintiffs and to outlast struggling families and devastated communities. On exactly the same day that The Wall Street Journal reported the recent 2015 Santa Barbara oil spill, it also reported the civil litigation settlement of the 2010 Deepwater Horizon claims – five years after that spill. Thus, allow me to state the obvious – oil companies can outlast the best of us. They have more resources, and they have more experience in defending against claims than public officials and private citizens have in asserting them. Public agencies and inspectors should continue to play a critical role in lessening the occurrence of oil spills. However, the quality of their skills and the diligence of their performance should not mitigate against imposing strict liability upon those companies which lay the pipelines, build the rigs, and profit from the oil. Whether a corporation has later, no-pun-intended, downstream rights of contribution from other partners, subcontractors, insurance companies, or other third-parties is beyond the scope of this article. Such monetary matters have little to do with protecting our nation’s ultimate resources – our people and our environment. It is to this end that strict liability must be fully mandated. But even the imposition of strict liability is not enough. Thus, secondly, criminal conviction and incarceration must be imposed upon responsible corporate officers and managers in the event of any oil spill. As with all criminal statutes, the characterization of the crime as between a misdemeanor and a felony and the parallel sentencing guidelines should track the seriousness of the wrongdoing. Thus, as initially foreign as the wording and concept may be, there should be misdemeanor oil spills and felony oil spills. As noted above in the context of strict liability, there are rare instances (e.g. acts of war, sabotage, or extreme natural disasters) where cases should not be brought and where incarceration should not be imposed. But in all other instances, it must be mandated. And it must be mandated without a requirement of proving any form of intent. Unquestionably, there is “intent” on the part of corporate officers for oil spills and pipeline leaks not to occur. But that is not enough. Instead, in order to achieve meaningful change in corporate practices, the concept of criminal intent must be substituted with the concept of managerial responsibility and planning and budgetary authority. There are many reasons why criminal convictions and incarceration (even if of relatively short duration) are required. Rig, pipeline, automatic pipeline shut-offs, and double-hull ship design requirements are not enough. Permitting, licensing, regulation and inspections are not enough. Industry self-regulation is not enough. Deferred prosecution agreements are not enough (See Borgen, M., “The Misuse of Deferred Prosecution Agreements,” February 23, 2015 at www.mackwborgen.com). All of these are subject to, respectively, corporate cost benefit analyses, bureaucratic error, or corporate mismanagement or disregard. Only conviction and incarceration of responsible and supervisory corporate management can instill the accountability which is necessary and which is beyond the application of cost benefit analyses. This is a harsh recommendation, but it is not part of a wild-eyed, broad-brush environmental manifesto. To the contrary, it is made with great reluctance. It is made despite the belief of this author that actions in the name of environmentalism have oftentimes gone too far; where the actions of environmental agencies have at times been myopic and not in the public good. Nevertheless, however, the recommendation for incarceration in this instance is necessary. And it is also not without precedent. The necessity of holding corporate management accountable via the harsh remedy of incarceration continues to be widely discussed in the aftermath of the financial collapse of 2008. This is especially the case since not a single corporate officer of any bank or financial institution has yet been sent to jail as a result of their corporate activities. See, e.g. Garrett, B., Too Big to Jail (2015) reviewed by Collin Levy, The Wall Street Journal, February 4, 2105 (“People should be concerned when a company admits its wrongdoing in detail and yet no individuals are held criminally accountable.”). However, despite the obvious parallels between the profit-motivated wrongful behavior and willful ignorance of corporate executives of financial institutions and those of oil and pipeline companies, the industry focus of this article is narrow – the oil and pipeline industries. The failures of corporate management in the context of the oil and pipeline industries are instances of where corporations are not people, where fines and penalties are insufficient to adequately alter corporate behavior, and where the consequences of doing nothing are dangerous, lasting, or irreversible. Neither such corporations nor their management can any longer be allowed to limit the costs of oil spills or pipeline leaks to line-item budget entries. They cannot be accepted as a mere monetary cost of conducting business. With the risk of conviction and incarceration facing corporate management, it is hard to believe that a drunken captain would have been allowed to drive the Exxon-Valdez onto the shores of Prince William Sound. With the risk of conviction and incarceration facing corporate management, it is at least likely that the predecessor of Plains All-American Pipeline would not have initiated litigation to avoid having to install automatic shut-off valves in its pipelines. It is not enough to target a few welders or to blame a few inspectors. But there are more reasons for the appropriateness of criminal conviction and incarceration. Dead birds and soiled beaches aside, neither corporations nor their management can any longer be allowed to merely adjust their balances sheets while impacted families must adjust their lives. As noted above, the harshness of this recommendation of mandated incarceration is recognized and legislative bodies will have to pound out the criminal definitions, the application of three-strike-type rules, and the sentencing guidelines. However, we all know the sad truth that a day in lockup cannot be monetized. It cannot be delegated. It is real. It is personal. It is impactful. For all of these reasons, the criminalization of oil spills, rather than the monetization of oil spills, has a far greater likelihood of underscoring the significance of the wrongdoing and of modifying corporate behavior. But even with the wider imposition of strict liability standards and the incarceration of responsible corporate officials, fines, penalties, and civil settlements should also still be imposed. However, the way such fines and penalties are reported must be changed. Thus, thirdly, monetary fines, penalties, and settlements must be reported by the media in a manner that is understood by the general public — the affected public. The problem is that fines and penalties are now reported as absolute and stand-alone numbers. They are reported without context and without an easy means of interpretation. Because of this the real import and meaning of such fines cannot be readily understood by most of the general public. Naked absolute numbers such as $2.1MM or $26.4BB or even $137.0BB have little meaning. Millions, billions, schmillions … What do they mean? How much to they really impact the paying defendant. Amounts of this magnitude appear large and consequential, but as discussed in my prior article, “The Challenge of Perspective and the Burden of (So Many) Numbers,” June 17, 2015 at www.mackwborgen.com., large numbers — standing alone and without context — have little meaning to most of us. Therefore, in order to provide such context, fines, penalties and settlements should be reported both as an absolute amount and as a percentage of the paying company’s annual revenues or profits. For example, at first blush a fine of $15.0BB seems to be a very substantial amount. However, to understand the real impact and meaning of such fine, it should be juxtaposed against the annual revenues and profits of the paying defendant. This is especially true in the context of oil companies (and arguably similarly in the case of banks and financial institutions). It is relevant that seven of the top ten largest companies in the world are oil and gas companies. Their revenues and profits are huge. For the year ending 2014, Exxon-Mobil reported total revenues of $394.1BB, gross profits of $127.3BB, and a net income of $32.5BB. Thus, using the above example, if this seemingly large fine of $15.0BB were reported as a percentage, it would be reported as a mere 3.8% of Exxon-Mobil annual revenues for the year, a mere 11.8% of its annual gross profits, and 46.2% of just one year’s profits. Lastly and fourth, the availability of remediation costs must be assured and pre-funded through mandated oil and pipeline company contributions to a remediation fund. Similar to banks and the Federal Deposit Insurance Corporation, oil companies should be required to make ratable, annual contributions to a publicly-administered remediation fund. This is doubly appropriate since at the present time and for the foreseeable future oil spills appear inevitable. A remediation fund is advisable because there will inevitably come a time when the subject corporation will not have adequate resources to remediate the spill site and to pay proven claims. Just a few years ago some observers thought that this was a real risk in the fallout of the Gulf of Mexico/Deepwater Horizon spill. Although debtor protection was not sought by BP, this bankruptcy scenario will eventually occur, and the existence of a pre-funded, immediately accessible remediation fund will avoid having remediation and claims being paid from public revenues. A remediation fund would necessitate administrative rules relating to contribution rates, fund management, and disbursement mechanisms, but even this is far preferable to the costly and burdensome use of our judicial processes which are now used. It may still be advisable for corporations to use or for governments to require the continued use of remediation insurance, but the in-place remediation fund would allow that same public to have ready access to the funds necessary to complete clean-ups and to pay proven public and private damage claims. It is hoped that this article will further our country’s debate about how to best address the on-going problems associated with oil spills and pipeline leaks. There is no magical guaranty. There is no magical formula. However, there is a problem, and it is time for this problem to be better addressed. Possibly you will allow me to respectfully suggest that it is time to implement these first four steps. Quoting from the title of this article, it is now time. 14,000 spills a year in this country. Most of them are small and inconsequential. But some of them are not. Some of them have severe and lasting impacts upon this country’s beaches and shorelines, upon our oceans and gulfs, our rivers and waterways. Some of them destroy private property and stain our public domain. Some of them devastate family businesses and entire communities. This can be stopped. It is time. Something must be done. This entry was posted on Monday, July 27th, 2015 at 10:22 am	and is filed under Latest News. You can follow any responses to this entry through the RSS 2.0 feed. You can leave a response, or trackback from your own site.